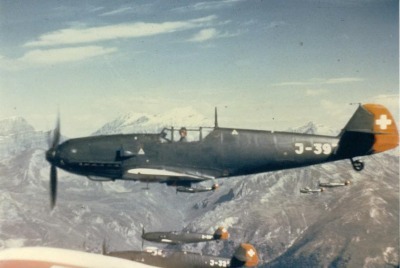 By 1947, the Swiss Air Force had the problem that its ageing fleet of WW2-vintage German Messerschmitt Bf-109E and G fighters had to be withdrawn from use within a short period of time, and the license-built K+W D-3801 Morane fighters (WW2-vintage, improved and license-built version of the French Morane-Saulnier MS-406 fighter-type) were also regarded as obsolete und no longer suited for first line interceptor-/fighter-duties. 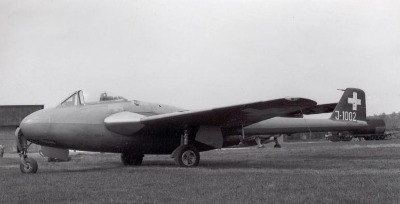 Although substantial numbers of modern DeHavilland Dh-100 Vampire and DeHavilland Dh-112 Venom jet-fighters were on order from the UK and an initial batch of Vampires was in process of being built under license locally, there was an urgent need for a stop-gap solution to equip several Swiss Air Force front-line fighter-units with a capable fighter plane as soon as possible. Messerschmitt Me-109E-3's of the Swiss Air Force, ca. 1946. K+W D-3801 Morane J-198 of the Swiss Air Force, ca. 1947. 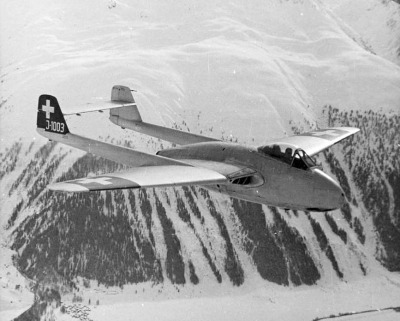 DeHavilland Dh-100 Mk I J-1003 over Switzerland during 1947. 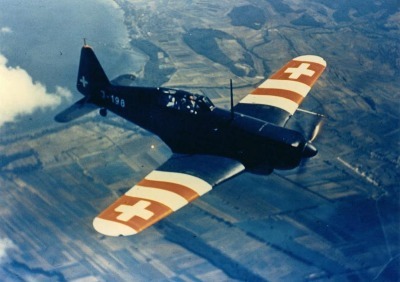 Four aircraft were acquired 1946/1947 for test and type certification prior to the Swiss license fabrication. Another early Swiss Dh-100, this time J-1002. 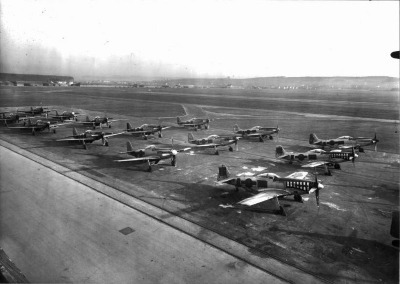 The knowledge that the US Army Air Force in Europe was offering surplus aircraft and equipment at favorable conditions resulted in a Swiss delegation visiting the US Army Air Force depots at Oberpfaffenhofen and Nürnberg-Fürth airfields in Southern Germany to survey the large numbers of fighter aircraft stored there. Endless rows with dozens of P-51 Mustangs and P-47 Thunderbolts plus many medium bombers and liaison aircraft were lined up at these locations, most of the planes in good condition, although some already had parts removed and obviously were used as spare-parts source for aircraft still in service. 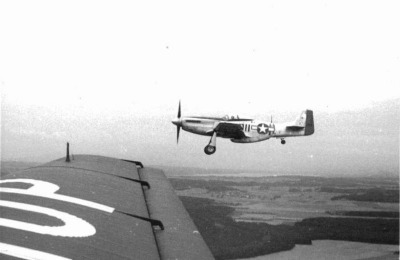 Following the favorable report of this delegation and the well-remembered performance of an interned P-51B Mustang that was tested by the Swiss Air Force during the years 1944/1945, negotiations started to purchase 100 aircraft of the latest version of the North American P-51D Mustang, including tools, spare-parts and replacement engines. Eventually, in December 1947, a contract was concluded that the Swiss Air Force shall receive 100 aircraft of the D-20 or D-25 version to be delivered as soon as possible, plus additional 30 aircraft for use as spare parts source. The first 26 aircraft were delivered by USAAF pilots early in February 1948, and the last of the 100 ordered planes arrived in August 1948. Arrival of P-51D Mustangs at Dübendorf during March 1948. The Mustangs always were accompanied by a Douglas C-47 transport plane to deliver spare-parts and to ferry the USAAF-pilots back to Germany after hand over. 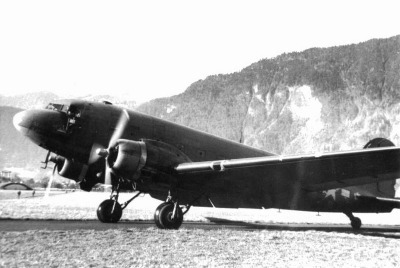 A USAAF C-47 taxying at Buochs Airfield, Summer 1948. Due to the Berlin blockade late in June 1948 by the Soviet forces and the ensuing ‘Berlin Airlift’ almost all US-aircraft, as well as maintenance- and flying-personnel were withdrawn to help in this effort of delivering food, coal and other much needed materials to Berlin by air. The remaining 30 additional "spare-parts" Mustangs therefore had to be collected in Germany by the Swiss Air Force. So in October 1948, the Swiss AF flew with mechanics, technicians and pilots in their valuable Junkers Ju-52 transport planes to Oberpfaffenhofen and started to inspect and overhaul the assigned Mustangs to make them ready for the ferry-flight to Switzerland. 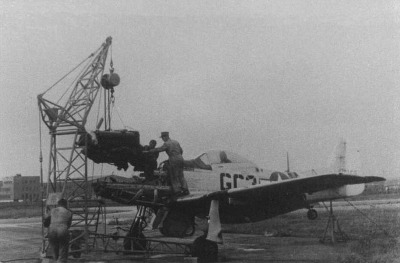 Swiss mechanics performing an engine-change on a Mustang destined for the Swiss Air Force at Oberpfaffenhofen Airfield, November 1948. The aircraft is P-51D-20-NA 44-72167 which was to become J-2118 (photo: Jakob Urech). By this time, the number of airframes in good shape (i.e. low-time airframes) was down to a minimum and in order to make the 30 aircraft flyable, many others on the field had to be ‘cannibalized’ for parts. But this operation, which also developed into a small ‘Airlift’ between Dübendorf Airfield and Oberpfaffenhofen, was successful and the first aircraft arrived in Switzerland still in October 1948, the last ones in December 1948. They all were ferry flown by Swiss AF instructor pilots already familiar with the Mustang. 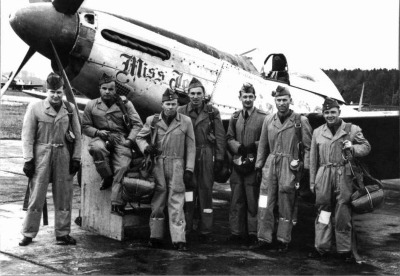 Swiss Air Force instructor pilots of UeG Staffel IV (later FlSt 16) ready for a ferry flight of another batch of P-51D Mustangs from Oberpfaffenhofen to Dübendorf during November 1948. The aircraft is P-51D-20-NA 44-63619 which became J-2107. P-51D-25-NA 44-72789 (J-2119) during ferry-flight from Oberpfaffenhofen to Dübendorf, photographed from an accompanying Swiss Air Force Ju-52 which had received temporary civil markings HB-HOP. Of note is the fact that the Swiss pilots ferried the Mustangs with lowered landing gear to avoid any trouble with hydraulics.